Fake News are the stories which appear to be news, spread on the internet or other social media, usually created to influence political views or as a joke. 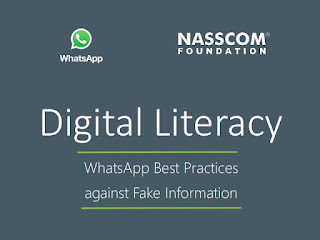 WhatsApp and NASSCOM Foundation will train nearly 1,00,000 Indians to spot false information and provide tips and tricks to stay safe on WhatsApp. The training curriculum involves real-world anecdote tools that can be used to verify a forwarded message and actions that users can take including reporting problematic content to fact checkers and other law enforcement agencies will be disseminated in multiple regional languages. The training is aimed at educating people throughout India to be mindful of the messages they receive and to verify the facts before forwarding. The training will be imparted by volunteers from NASSCOM Foundation through "each one teach three" campaign that mandates every volunteer to share their learnings with three more persons leading to a network effect. Further to enhance the reach of the campaign volunteers will post their takeaways from the workshops on their social media handles. The initiative is aimed at eliminating the miscreants who entice anger and hatred by spreading false and doctored information through technology platform. Q. Which social media company and 'National Association of Software and Services Companies (Nasscom)' have decided to work together to impart digital literacy for curbing the menace of fake news before the general elections?